My family and I enjoyed a fun-filled, scare-free day in Camp Spooky at Knott's Berry Farm. The day started with huge smiles when the Peanuts Gang joined us for breakfast and cookie decorating at the Grizzly Creek Lodge. As you can tell from Isabella’s face, cookie decorating is serious business in our house. I was pleasantly surprised at how kid-friendly all the rides were in Camp Snoopy. My daughter was able to enjoy all of them by herself or with an adult. Definitely a plus in my book!!! Another highlight was watching her trick or treat throughout Camp Spooky and take photos inside the Great Pumpkin Hay Bale Maze. Dress up your little ghost or goblin and head on down to Knott's Berry Farm for the friendliest Halloween party at Camp Spooky! Snoopy’s Costume Party runs weekends October 6-28 and is included with regular park admission. Disclaimer: I was not paid for this post. I was invited to attend Camp Spooky and the views expressed are my own opinion. 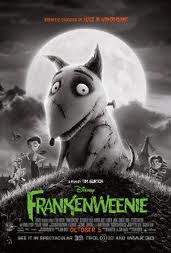 Disney's Frankenweenie is a poignant story about friendship between a boy named Victor and his dog Sparky. When Sparky dies after getting hit by a car, Victor turns to science to bring his loyal four-legged friend back to life. He tries to keep the successful experiment a secret but when his classmates find out and try to recreate Victor's revival in hopes of winning the Science Fair trouble ensues. I must warn you to bring tissue and lots of it. I caught myself bawling at certain parts because the connection between Victor and Sparky is so endearing that it is simply heart-wrenching to imagine them apart. I must admit that my four year old was a little reluctant to attend the screening but after the first 10 minutes she was hooked. Now every time she sees the movie posters she yells, "I saw that and I wasn't scared! Can we see it again?" You can't ask for a better endorsement than that. There are colorful characters amongst Victor's classmates including a needy misfit named Edgar "E" Gore, the over-achieving mad scientist "Toshiaki" and (my favorite) a girl with a prophesizing cat and an unnerving stare suitably called "Weird Girl". The three dimensional stop motion animation is fascinating to watch under the direction of Tim Burton accompanied by the music of Oscar nominated composer Danny Elfman. Kudos to all of the voice actors for making each character so distinct and memorable. Be sure to catch Frankenweenie in theaters opening this weekend Friday, October 5.